I have a super simple and cute Valentines craft for you. Inspired by Pinterest. I made this with my toddler but definitely could be made by a preschooler too most likely with less help. 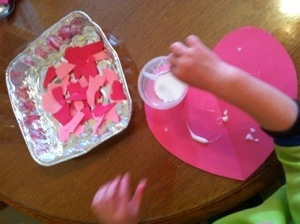 I cut out a few hearts and tore a bunch of valentine colored construction paper into gluable sized pieces. My son glued the pieces onto the heart. 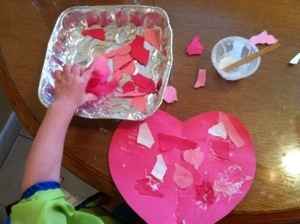 If your child is a little older you can just draw a heart and get them to glue the pieces inside the heart. 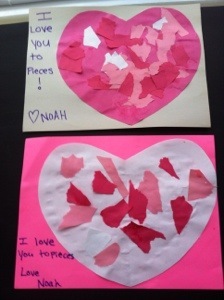 I then glued the heart onto a larger piece of paper and wrote ” I love you to pieces!” My heart was too big and or the construction paper too small. So I offset the heart to make the words fit. You can adapt that!